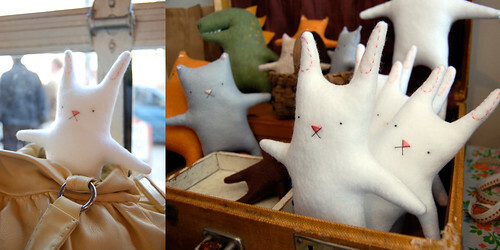 A few months ago, at the Spring Thing Trunk Show, I couldn’t resist picking up a felt bunny by Lesley-Anne Green. Out of the herd of pristine white felt bunnies, I fell in love with this particular one. I named her, ‘Perfect Bunny’ (PB), because she’s pretty perfect. I quickly learned that Perfect Bunny loved to travel around and was just the perfect size to fit into my handbag. PB has been begging me to take her on a big trip, so this past weekend she came with us to New York City. While PB is preparing her NYC diary for you, I thought you should meet this little bunny’s talented creator. 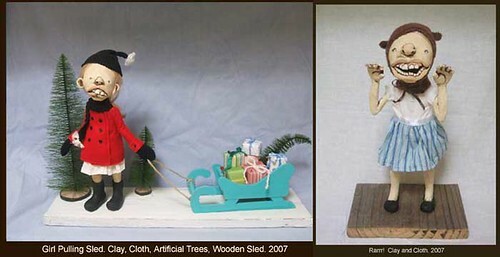 Lesley-Anne Green is an artist with two distinct styles. Her felt creatures are as sweet as can be, while her ceramic figures tug at your heart strings in a completely different way. Having a recognizable style is something I really admire, but having two is just phenomenal. What is your creative background? Did you go to school for it? Lesley-Anne: I went to Sheridan College and took their Ceramics program. My first semester there I took both textile and ceramics courses…I kind of wanted to do both and was really torn, but in the end chose ceramics. Your work is quite diverse, in terms of aesthetic. Do different things inspire you for your different types of work? Lesley-Anne: Yah, it’s funny, my ceramic work and my felt work are soooo different. I think because my clay dolls were so intricate and detailed, that when I sat down to start working on the felt animals I wanted them to be the exact opposite….just really simple and stylized….and cute! Do you have any new projects or ideas that you are working on right now? Lesley-Anne: At the moment I am getting ready for the One of a Kind christmas show, so that is going to take up every single minute of my time until the show is over! I also have lots of designs in mind for new felt animals…just no time to work on them…if only there were two of me!!! Lesley-Anne also has an etsy shop, if you’d like to get a fun felty companion of your own. Stay tuned for the adventures of Perfect Bunny in New York! I love those perfect “X” noses. On another note — here’s the selvedge lady I mentioned — she’s NUTS about selvedges and makes things out of them. Jodie at http://vintagericrac.blogspot.com/. These are pretty cool. They would make such a good gift. i love lesley anne’s work! I also love lesley anne! We worked together for a short time at a local bookstore, and it was always such fun to see her. I am glad that she is sharing her unique and brilliant creatures, be they fuzzy and fun, or clayish and oddly lovable. All of it is great!